It’s 4 a.m. and Chef Costas Spiliadis is on the phone with suppliers, ensuring the day’s fresh fish will arrive in Las Vegas on time from Portugal and Greece. It’s not a direct flight. The fish—all line caught—go through London first before making their way to America, where they will eventually end up at Estiatorio Milos at The Cosmopolitan of Las Vegas. 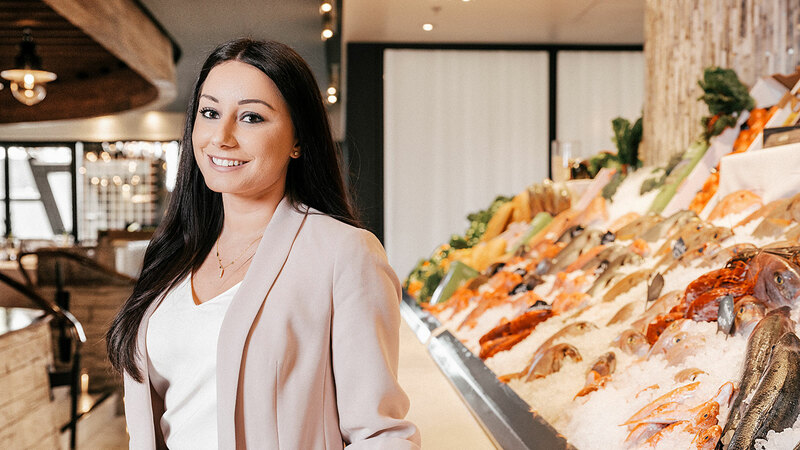 Keeping the fish market stocked is as much about meeting demand as it is about freshness and quality, because more and more, Lappas and her team are fielding questions about the Mediterranean diet. The Mediterranean diet, for the uninitiated, refers to the dining traditions of Greece, Italy, and other parts of southern Europe. Lauded as one of the healthiest diets on the planet, it is an eating approach embraced by Chef Spiliadis, a native of Patras, near the ancient Greek village of Olympia. Instead of emphasizing meats, heavy sauces, and saturated fats, Chef Spiliadis has prepared a menu at Estiatorio Milos that focuses on making food flavorful through simple additions. “Rather than adding creams and sauces, you can add a dash of sea salt and olive oil,” Lappas explains. “Just like that, you’re having the best tomato salad you’ve ever had in your life. Anderson, whose MIDY Methods fitness practice highlights eating behavior among the four “pillars” of health—alongside mindset, activity, and lifestyle—says traditional diets have a start and end. The Mediterranean diet is more about taking a new approach and paying attention to the signals your body sends when it likes the foods you’re eating. Stock your kitchen with the essentials. Anderson’s list of heart-healthy, nutrient-rich recommendations includes: vegetables, fruits, nuts, seeds, potatoes, whole grains, fish and other seafood. “Mediterranean meals have a little bit of poultry and red meat very rarely,” he says. When shopping at the grocery store, stay on the outer perimeters if you want to avoid processed foods and saturated fats. “I would imagine in the Mediterranean they wouldn’t have a lot of processed foods in their markets, even in the middle aisles,” Anderson says. As opposed to butter or margarine, olive oil – especially extra virgin olive oil – is a much healthier alternative. It can also be used as a mixture for dressings, or a glaze for fish before you put it in the oven. Omega-3 fatty acids, the kinds found in fish, are among the healthiest fats, and are also good for your heart. Zhaklin Lappas photo by Lucky Wenzel.